PAIEMENTS: Nous acceptons les paiements par carte de crédit. Paiement de 50% du dépôt de garantie et les frais de location de 100% est requis dans les 5 jours de faire vos réservations. Votre paiement rapide est appréciée, car nous sommes incapables de garantir une prise sur tous les biens de plus de 5 jours sans paiement. Le paiement final, taxes et frais compris est dû 30 jours avant votre arrivée. Dès réception de votre paiement final, nous vous ferons parvenir une confirmation définitive montrant vous êtes payé en totalité, avec les instructions d'enregistrement. - Annulation 30 jours avant l'arrivée: remboursement de toutes les sommes reçues moins les frais administratifs de 100 $. - Annulation de 15 à 30 jours avant l'arrivée: remboursement de 50% de dépôt brut de maintien de taux d'hébergement moins 100 $ de frais d'administration. - Annulation moins de 15 jours avant l'arrivée: Déchéance de toutes les recettes de location. Caution sera remboursé. - Les chèques retournés pour une raison quelconque seront facturés des frais administratifs de 50 $, et votre réservation sera automatiquement annulée. - Pour vous protéger de circonstances imprévues, s'il vous plaît contacter votre agent d'assurance personnelle pour se renseigner sur l'assurance Voyage. We had a wonderful women's weekend. It was relaxing and cozy. The house has everything we needed and Elisabeth is quick to respond to any concerns or questions. My husband and I wanted a log cabin getaway. This sure was perfect. Beautiful home with plenty to do or sit and watch it snow and listen to a crackeling fire. We would love to return with our family next! Relaxing and fun winter weekend getaway. 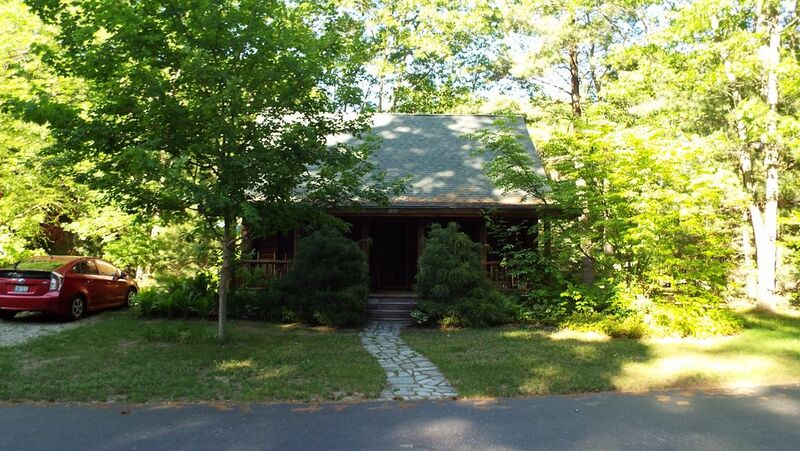 This cabin is the perfect place to be with friends or family for a relaxing and fun getaway. Snow on the ground provided the perfect backdrop for our time in the hot tub, which comfortably sat 6 of us. The basement has a closet full of board games, a pool table, card table, and plenty of seating, though the pool cues are not in the best shape and we were without chalk. Even still, we managed to play a few rounds. The kitchen was well-stocked with all the equipment we needed for meals and the oven and stove worked great. Rooms are all comfortable with adequate beds. It was an easy walk to the lake, which was very scenic. Cooking on the grill is possible with charcoal and the right prep work -- we managed to cook perfect steaks on it. Check-in and check-out was easy with very clear instructions from the host. I would stay here again. Had a great time, weather not so good. The log cabin was darling, log cabin in the woods, nicely appointed. We spent a great Labor Day weekend with two families in the Hidden Dunes cabin. We were able to get this cabin semi-last minute. The location is ideal, close to Saugatuck, Holland and other surrounding towns. There is great beach a short walk away. The hot tub is a huge bonus, as it provided activity for rainy days and relaxation in the evenings. The downstairs gaming area was a hit with kids, ages 3-6. Beds are a little small but we didn’t find them as uncomfortable as other reviewers. Our only negative thing to say was prior to our 10am check out, someone (property manager maybe?) was basically circling the house stalking our departure. 5 minutes to 10am, she was on the lawn and asked when we would be done, we said we were just gathering the last of our things and would be out shortly. After last minute bathroom breaks for the small kids and doing a last minute walk through, we were out by 10:10, and the woman pulled in immediately after us, after driving up and down the street multiple times slowly. I understand we were a few minutes late but felt the mad rush was unnecessary. In any case, the House was great and we would come back again! Very charming log cabin next to a small, serene lake. We enjoyed our time in Sagautack. The cabin is in a small private community of similar log cabins, with plenty of space for kids to run around or go to a private beach and swim in the lake. The cabin itself is very well furnished with a full game room down stairs and 4 great bedrooms with comfortable mattresses. The screened in back porch is also great for late dinners and relaxing in the evening. The kitchen came fully stocked and the hot tub was easy to use. The location is also fantastic as it is a short drive to everything Saugatack / Douglas / Holland have to offer.